Left: The hardback edition cover (2016). Right: The softcover edition cover (2018). 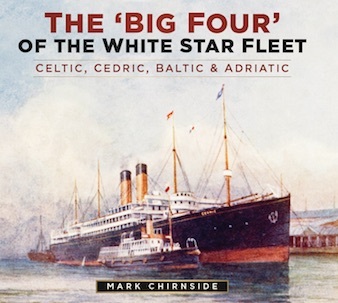 The White Star Line’s Celtic (1901), Cedric (1903), Baltic (1904) and Adriatic (1907), collectively known as the ‘Big Four’, served for a combined 110 years. Together they carried around 1.5 million passengers on the Liverpool to New York and Southampton to New York routes during their time in service. Arguably the most successful series of ships the company ever produced, they have been overlooked in maritime literature until now. In this ground-breaking book, Mark Chirnside relates the history of the ‘Big Four’, in many ways the forerunners of the famous ‘Olympic’ class ships. Features including a gymnasium and Turkish and electric baths were trialled on Adriatic before their use on Olympic, Titanic and Britannic. Charting their history from civilian passenger ships to armed merchant cruisers and troop ships in the First World War, The ‘Big Four’ of the White Star Fleet explores the adventures and experiences passengers and crew had on board over the decades. ‘Excellent book. Well written with a multitude of pictures. One of the best... It's nice to see lesser known liners and their interiors. Thanks again for a wonderful book.’ Neil Lucas, 24 October 2016. Facebook. ‘Mark is one of my favourite authors, you can’t go wrong with his books’. Peter Meersman, 25 October 2016. Facebook. ‘What a wonderful book… I had not realised before reading the book that Celtic was, at the time, the biggest ship in the world… It is beautifully presented and a great treasure.’ David Hume Elkington, 28 October 2016. ‘It is always a delight when Mark Chirnside authors a new book. 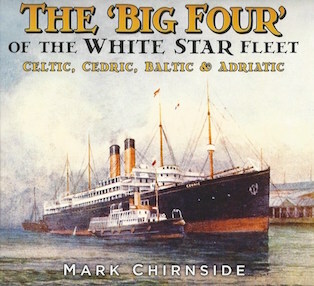 His newest one deals with a neglected subject, White Star Line's 'Big Four'. The luxury liners Adriatic, the Baltic, the Cedric, and the Celtic each had long and lively careers while crossing the Atlantic. ‘There are also appendices of construction chronology, specifications, and passenger statistics. ‘An authoritative text is interspersed with rare accounts by people who sailed on these four ships. These rare glimpses by those who were there give this volume a more intimate quality and a rare window in the past. Passengers talk about beauty of the ships interior, the daily routines, unusual instances that made the voyages more exciting. And these voyages were exciting from powerful storms, sea rescues, darting across the Atlantic to avoid submarines, unfortunate groundings, and final goodbyes to the scrapyard. The author takes care to describe these instances in great detail, aided by the words of people who were there. ‘The infamous JP Morgan is quoted in the book talking about why he liked the Adriatic, "Ships have personalities. I like this one." There was a lot to like about these vessels. The Adriatic had a pool, elevator, and turkish bath, among other amenities. These four ships had dining rooms with high vaulted ceilings, carved wood work and stained glass. Second and third class are not forgotten either. The author shows through photos how they are an improvement from older liners. Thumbing through the book, the reader will find rare images of the interiors, deck plans, onboard memorabilia such as menus, passenger lists, log cards, and souvenirs. Many of these items appear in a generous color section in the middle of the book. ‘The photos of on board life make this book a particular delight. Many were taken by passengers and crew and reside in the collection of the author and other collectors. Unique photos of different parts of the ship such as the engine room will delight the technological ships fans. Amusing pictures of locals diving off the deck of the ship into the waters of Funchal or passengers gathered around Captain Marshall give it a "you-are there" feeling. Particularly rare are the ones of those of the Celtic held fast to the rocks in 1928. Sadly this would be the end of the ship and as we read, she was slowly dismantled on the spot. ‘Over the last ten or fifteen years, Mark Chirnside has rightfully gained a reputation within the maritime community as being a first-rate historian. As a maritime historian and author myself, I know how difficult it is to turn up new material and follow the trail of evidence to correct conclusions. I've worked with Mark on several projects, and he always manages to help me find some valuable nugget of information that I need, just when I need it. Yet every time I pick up one of Mark's new books, I'm astonished to see what he has managed to put together. ‘So much has been written about the Titanic - and now, although to a lesser extent, her sister ships Olympic and Britannic - that it is easy to forget that they were just three ships of the White Star Line's fleet. Their immediate predecessors, the so-called 'Big Four' liners, have gone largely overlooked except as a footnote to the Titanic tragedy. Not any more. These four ships, so long forgotten, have finally been given they treatment they deserve. Mark has collected a treasure trove of information, first-hand accounts, technical data, photographs, and ephemera on this quartet of liners. The format is beautiful. ‘This isn't a plug for a friend... Mark knows me well enough to know that if I thought it wasn't good, I would say so as tactfully as I could. This book is a real gem, and I'm proud to add it to my collection of maritime volumes. ‘Thank you so much for the copy of your magnificent book. It is a great tour de force, painstakingly researched and beautifully presented.’ Frank Grenfell, 10 February 2017. ‘The book carries the stories of “The Big Four” all the way from launch to their ends. In addition to accounts from their passenger carrying years, we also see how each survived the First World War…A chapter also describes the wreck of the Celtic in 1928: the rescue of the crew and passengers, and there are a number of photos of her after she hit the rocks off Queenstown Harbour. These photos and the accompanying text, show us the gradual dismantling of the hulk, and the sad end of a great ship. ‘The photos of the book are usually crisp and sharp, except in the few cases where the available source material is just not that good. Also included is a twelve page colour section, illustrating the ships, their interiors, and various advertising materials. After reading “The Big Four” I know much more about these ships, and how they led into the planning for the “Olympic” class. It is a good addition for anyone’s shipping library’. – Bill Wormstedt, Titanic Commutator 2017; Volume 42 Number 217: Page 23. Readers with any documented corrections are invited to contact Mark in the hope that mistakes can be rectified in any future editions.